First let me state – this is not a paid for post and I have not been given this game to review. 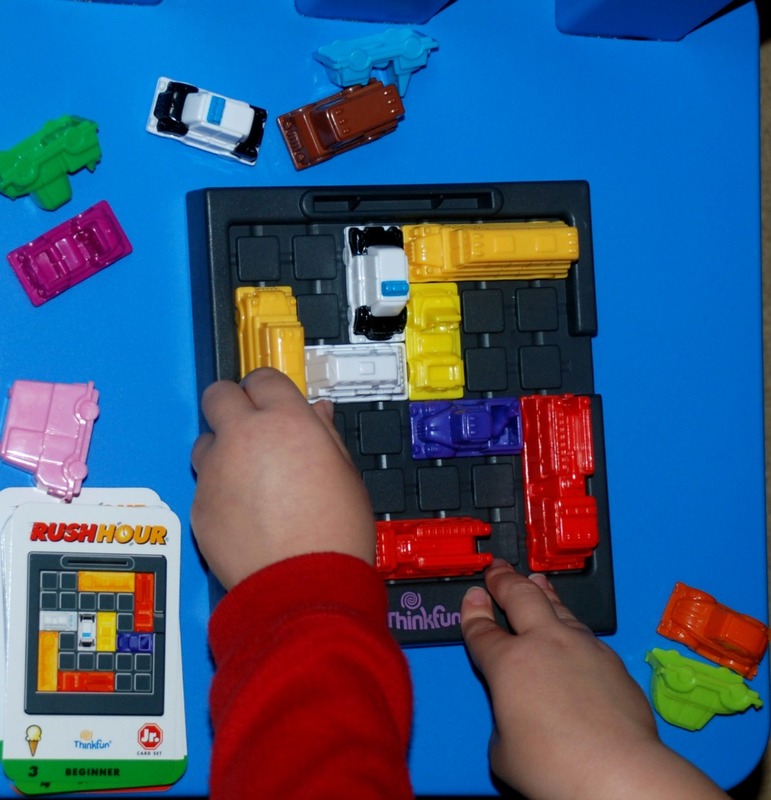 I bought the Rush Hour Junior game (affiliate link) as a Christmas present for my 5-year-old son and it has been so popular with the whole family that I thought I would share my thoughts on the game. The reason why I choose to buy this game in the first place is because we have a game called Camelot Junior which is hugely popular with the kids and in my opinion is an excellent logical thinking game for kids. The kids have to set up the wooden blocks in the same order as depicated in the book and then they use the remaining blocks to form a link from the prince to the princess. It starts off with some easy examples and then gets progressively harder. It is a brilliant problem solving game. So when I was thinking about Christmas presents for the kids I knew I wanted another game that had a similar problem solving aspect to it as Camelot. I read a number of reviews and I ended up choosing Rush Hour for a number of reasons. 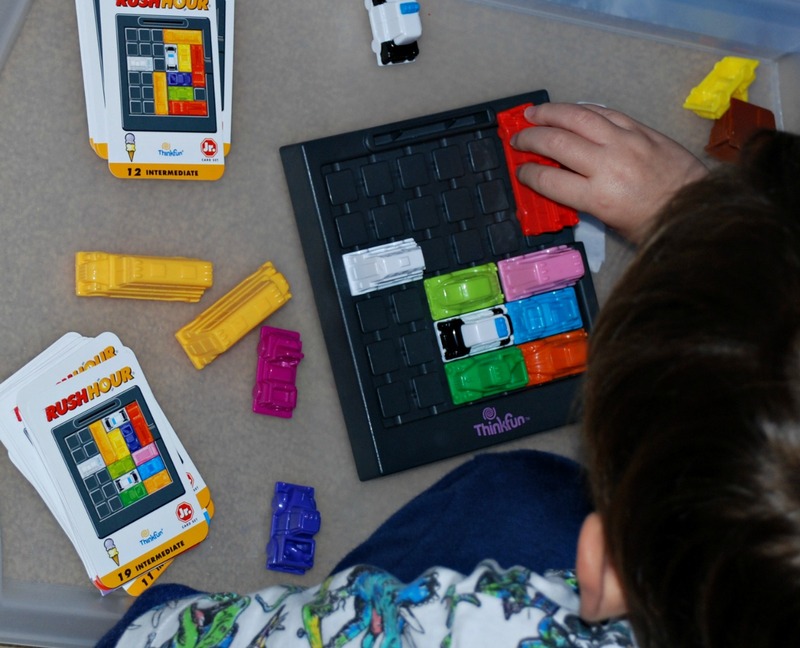 Firstly it is a car game – which for a car mad little boy is always going to be a big plus. But more importantly I liked the concept that you are given scenarios and the kids then need to figure out how they are going to get the Ice-cream truck free. Again problem solving !! The game has 4 different level and there are 10 scenarios for each level. To start with the kids choose a card and they need to set up the board so that the cars on the board match the cars on the card. Then they have to move the cars so that the Ice-cream truck has a clear path to drive out the exit. All the cars can only go forwards and backwards – they can not move sideways. One of the first things that this game taught my son is sometimes you need to move a vehicle in one direction so that it frees up a path for another vehicle and then you might need to move the first vehicle back again. My 5-year-old is learning to think a couple of steps ahead while playing with cars. Brilliant !! And yes as they progress the scenarios do become more complex and hence the solutions are not as straight forward. But my son is already on level 3. 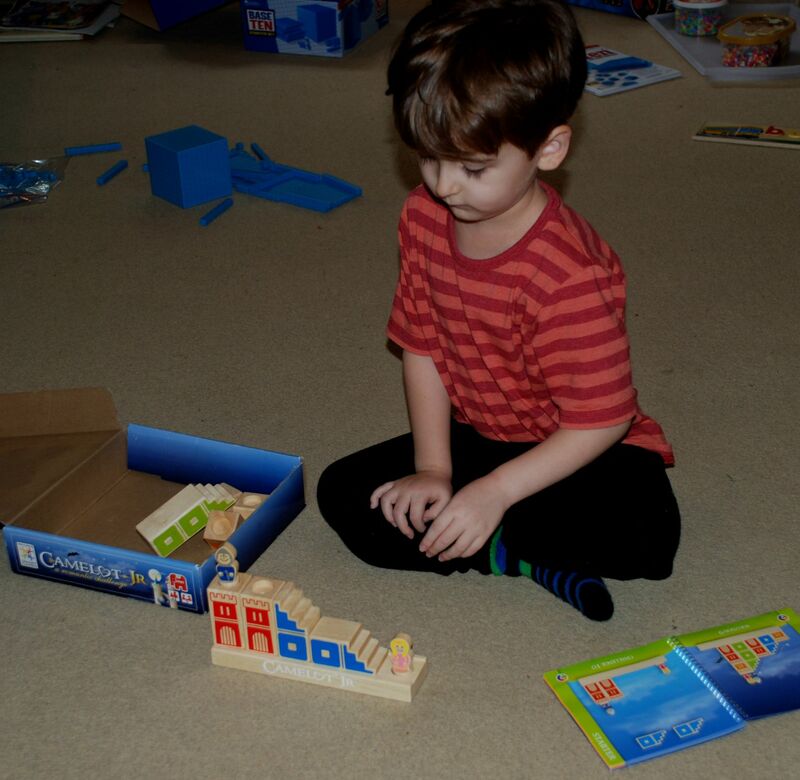 Granted he is a very determined 5-year-old and he does have a knack for puzzles and problem solving. He loves it and I honestly do think it is a fantastic kids game to have in the house. This entry was posted in Homeschooling and tagged Camelot game, educational games, home ed, homeschooling, Logical thinking for kids, reviews, Rush Hour game. Bookmark the permalink. I much prefer reviews of real purchases to the ones where people are given free stuff ‘in exchange for an honest review’. I would far rather hear about the games and books that people have actually chosen for their kids. It sounds like a fun game and a great way of developing strategic skills.